I headed south from the Stour Valley just a couple of miles to the Colne Valley. Colne is pronounced 'cone', incidentally. You can feel a change as you approach the village of Chappel and Wakes Colne, a village dominated by one of the largest railway viaducts in the east of England and divided into two parishes by the River Colne. There are two churches. South of the river there is just a pub, a school, a row of cottages and the Chappel church of St Barnabas. On the north side of the river there are many more houses, but the Wakes Colne parish church of All Saints is out on the western edge of the village on the way to Halstead. Locked with a keyholder notice.The key is easily obtained at the forge next door (a proper ironworks, which perhaps survives from when that was the main industry of this area). A bit gloomy inside - Pevsner led me to expect rather more than there is, and in truth I probably liked this one least of the nine of the day, although it obviously has more to explore than its neighbour across the river. The 1911 wall paintings are as gloomy and uptight as you'd expect of the date. There is a most odd stairway about halfway along the north chancel wall - Pevsner says the church was once cruciform, and perhaps this was connected. 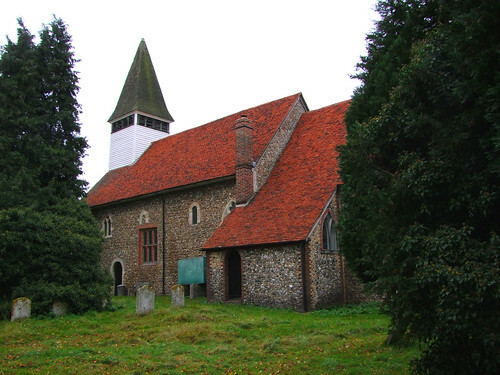 Now it looks a typical mid-Essex church with its rendered walls and wooden ball turret.